Q: I often ask clients to focus on mental images, such as a wise inner guide, but find this work falls flat for some people. How can I use imagery more effectively? A: Many years ago, I attended a two-hour workshop on ego-state therapy and came home never to practice the same way again. When clients said, “I’ll never find love,” instead of saying, “It sounds like you feel hopeless,” or challenging their self-defeating automatic thought, I asked, “What part of you is making dire predictions?” One client, Aimee, said she pictured a little gnome telling her she’s a failure. She added that she felt it had been with her since high school, but a different part of her had always been able to counter it with compassionate words. When I asked her what the compassionate part looked like, she said she immediately pictured a purple dolphin, able to cut through negativity with grace and the hint of a playful smile. As we explored the kinds of things the dolphin might say to the gnome, they took on new depth and meaning. Throughout our work together, she often reported calling upon the dolphin between sessions whenever the gnome got particularly loud. I soon found, however, that unlike Aimee, other clients had trouble imagining their various subpersonalities in useful ways. When I asked them to visualize the angry part of themselves—or even a safe place or a wise inner guide—they struggled to bring these mental images to life, which of course resulted in a frustrating session. When I pushed with verbal prompts, several of these clients simply shut down. “I can’t do that. Nothing comes to mind,” one man told me in no uncertain terms after I’d suggested he go inside himself for a moment and envision the part of him that believes the world is a dangerous place. We sat in silence for a moment. Then he saw a postcard of Edvard Munch’s famous painting of The Scream tacked on my bulletin board. “That’s the part of me that fears life,” he suddenly declared. To my astonishment, this laconic man stood up and, taking the postcard in his hand, began to talk openly about the terror-driven part of him in ways I hadn’t heard from him before. Realizing I also needed to help him vividly connect with inner strengths, and inspired by his un-expected engagement with The Scream, I gestured toward the back wall of my office, where years ago I’d hung some reprints of landscapes I liked. “Do any of these images speak to you?” I asked. “I’ve always felt good in the mountains,” he said. “I grew up in New Hampshire, and they give me a sense of peace.” I could see tension melting from his face as he gazed wistfully at the mountains. Noticing this shift, I encouraged him to silently tell his terrified part that it had endured a frightening childhood, which had made it hard to realize he could protect himself now. With a look of surprise, he said the screaming face now seemed soothed. Just the simple external stimulus of those visual images was enough to open new doors for him. Rather than asking him to conjure up his own mental images, giving him something to respond to sparked his imagination and enlivened our work. Over the years, I’ve honed my approach to using visual (as opposed to mental) images, which combines somatic, brain-based, and inner-dialogue therapies. In fact, I’ve found that when clients juxtapose disturbing images that personify parts of themselves with uplifting ones framed as internal resources, and then bring that experience into their bodies with sensory awareness or movement, a lasting therapeutic change often occurs. To make sure that clients are doing more than just talking about feelings, I next ask what sensations they notice as they look at a chosen picture. Noticing physical sensations makes a brain–body connection that Fritz Perls called losing your mind and coming to your senses, which adds a crucial dimension to the therapy experience. Before further focusing on disturbing sensations, I want to connect people to their inner strengths. I ask them to choose an image from 24 uplifting picture cards that they like for any reason. I find that having clients choose pictures they enjoy and asking what they like about them is a projective device that helps them identify qualities they value. These can easily be reframed as inner resources or strengths. After years of using various images, I’ve learned which ones usually resonate with people: a carefree fool, dolphins, soaring eagles, warming suns, starlit night skies, inviting water, and religious figures of all kinds. Although not Jungian by training, even I could recognize these archetypes. Viewing them with clients creates a shared experience of their awe or joy or calm, whereas mental imagery is a more solitary experience, which keeps me from fully joining clients in the amphitheater of their minds. To heighten their feelings after choosing an image they like, I ask clients to look at the unsettling image they initially chose. Neuroscience shows that disturbing images activate the amygdala, releasing adrenalin. This makes emotions less stable and more available to change. After they reexperience their distress, I suggest that they look at the uplifting image they chose while simultaneously focusing on the feelings evoked by the unsettling one. Uplifting images activate the left prefrontal cortex, which then stimulates the nucleus accumbens (the reward center of the brain) to release dopamine. Asking clients to keep this dual focus allows calming neurochemicals to offset the fight-or-flight hormones brought on by the disturbing image. In Bruce Ecker’s coherence therapy, juxtaposing symptom-producing memories (the “curse” of not finding work) with incompatible ideas (“I give people hope”) facilitates healing. This may also happen when pictures “mismatch” the different neurochemicals that stressful and uplifting images evoke. 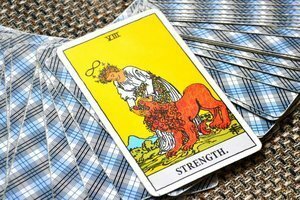 Now that almost all my clients have cell phones, I add a final step: having them take pictures of the images they choose, with their strength cards in prominent positions, where they can manage vexing inner parts. When feeling distress, rather than delving inside to find a mental image, they can easily see the part causing angst, and quickly focus on and expand their uplifting image. This is no-fail homework. Although I’ve used particular collections of pictures—like Tarot, Osho, and Inner Active cards—many available decks contain evocative images. And simply having striking art hanging on your walls can be useful. Paintings from Picasso’s blue period and anything from Leonardo da Vinci are handy focal points. Wayne’s snowy scene is a striking addition to my office decor, and I imagine the sun bringing warmth and energy to a frozen world, just as I hope pictures become a treatment tool that enlivens psychotherapy. This blog is excerpted from "Picture This!" by Kate Cohen-Posey. The full version is available in the May/June 2018 issue, Men and #MeToo: What Are They Thinking? Hi Kate, I have a beautiful deck of card images that I've found very useful and evocative for clients. You can find them at http://shahastra.com/mts-cards.html Thanks for you article!